Shingon Buddhism — esoteric Buddhism brought to Japan from China during the early ninth century — inspired a new spiritual energy that found expression in varied forms, especially in art and iconography. A radical change occurred with the introduction of new deities, among them the Five Great Kings, the most important of them being Fudo Myo-o, the conqueror of all disasters and evil. 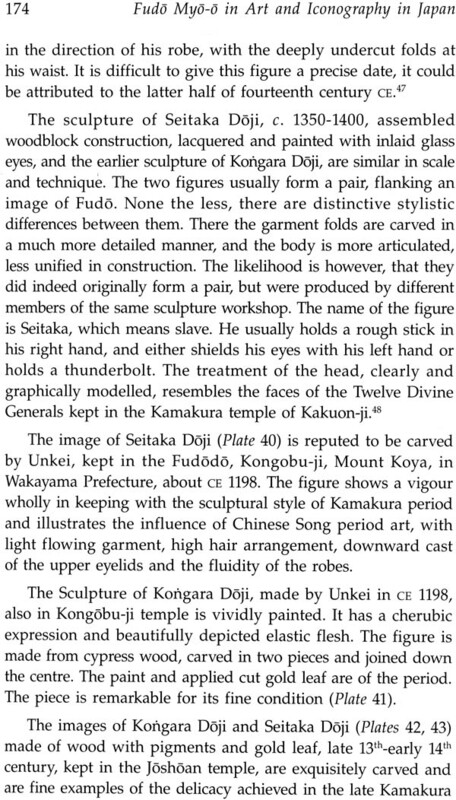 This book is a study of the concept, iconography and decoction of Fudo in art. 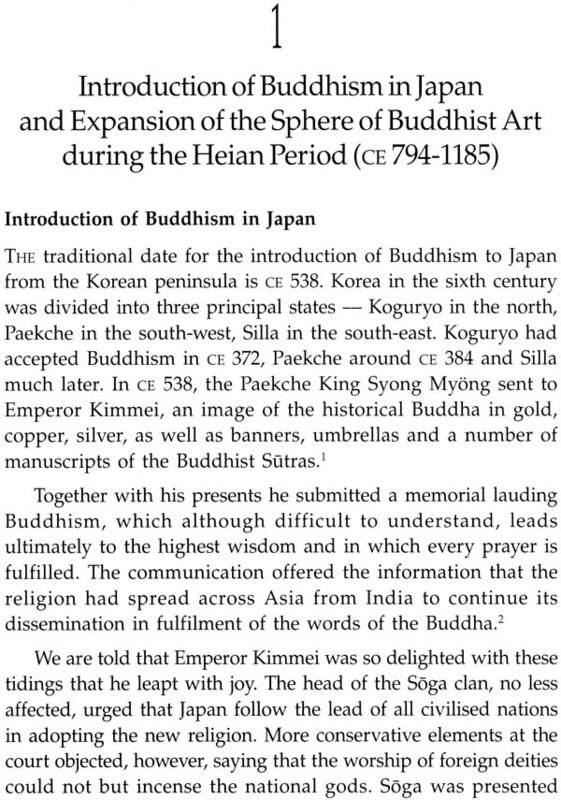 Beginning with a detailed account of the origin of Buddhism and its introduction into Japan, the book focuses on development of esoteric Buddhism in the country. It delves into the uniqueness of Shingon Buddhism rituals which try to evoke the vitality of the three mysteries in the body, speech and thought, the mysteries being transmitted orally from the master to the disciple. Describing Fudo Myo-o as discussed in Buddhist literary sources from India, it takes up his visual representation in painting and sculpture. 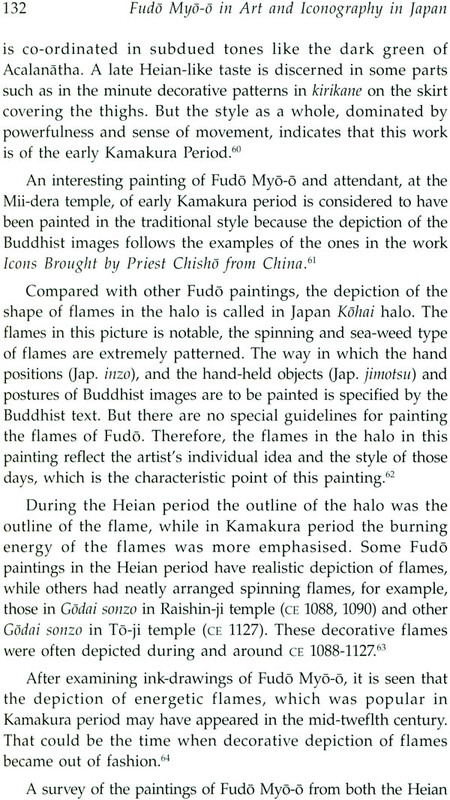 It discusses the representation of his attendants in art and iconography, symbolic instruments associated with the god in his depiction and interpretations of the madras (hand gestures, postures, emblems) carried by Fudo. It explains the esoteric meaning attached to various ideas and concepts represented in the visual images. Supported by numerous illustrations, this detailed and thorough study would enthral students and scholars of Buddhist art and iconography. Dr Sampa Biswas has done her Ph.D. in Art History from kala Bhawan, Santiniketan, and West Bengal. She is the author of scholarly papers and studies on Japanese Art, Central Asia including the book Indian influence on the art of Japan (2010) .At present she is teaching Art of China and Japan, Buddhist Art of Central Asia, and art of South-East Asia in the Department of History of Art National Museum Institute, New Delhi as a visiting scholar. 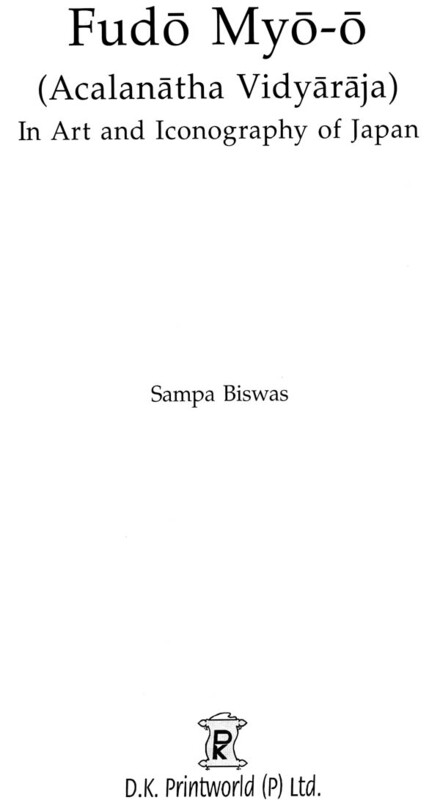 As a well established researcher in the field of cultural relations between India and Japan, Sampa Biswas is now bringing out an interesting research volume which would undoubtedly add another laurel to her credit. The subject chosen by Sampa Biswas is unique in the sense that the Myo-o had his origin in one of the Hindu deities, Siva. Myo-os, with multiple forms were incorporated into the esoteric Buddhist pantheon, while hierarchically placed next to the buddha and bodhisattva, i.e. Myo-os ranked third important position, while fourth rank was given to the devas in the Ten-bu group. Therefore, being originated from one of the Brahmanical (Hindu) deities, the Myo-o or Vidyaraja can be easily considered to be one of the aspects of fusion of Indian culture that occurred in China, Mongolia, Korea and in Japan. The Myo-o deities, after their incorporation into the esoteric Buddhism in the 9th century, gained high popularity in Japan. The Myo-os or Vidyarajas, kings of light and wisdom, are considered to be the “incarnations of the cosmic Buddha” and the Myo-os gained popularity for the belief that Myo-o or Vidyaraja protects the worshipers with the power of sacred word Vidya which means “Mantra or Dharai: ti”. Being her supervisor at the Viva-Bharati university for her Ph.D. thesis, I had been fully confident that Sampa Biswas would prove her worth in researches on aspects of cultural relations between our two countries, India and Japan, and like her first publication entitled, Indian Influence on the Art of Japan, her present publication too will be equally acclaimed internationally. I have no hesitation to say that the present volume is an in-depth study on the interesting roles which the Myo-os play in providing the believers promises of protection from the evil effects of various kinds. 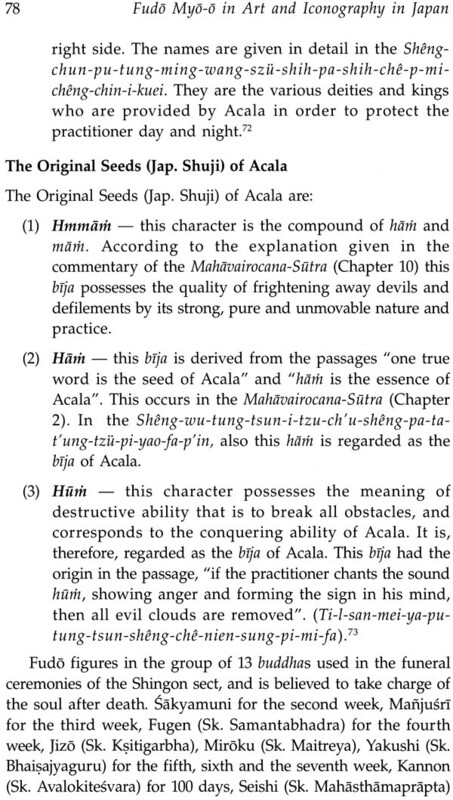 Sampa Biswas has dealt with the different iconographic features of the Myo-Os who are variously called Fudo Myo-o (Acalanatha), Aizen Myo-o (Ragaraja), Kongoyasha Myo-o (Vajrayaka), Gundari Myo-o (Kuiua1i), GO Dai Myo-o (Five Wisdom Kings) and also some of the fierceful forms of the deity. 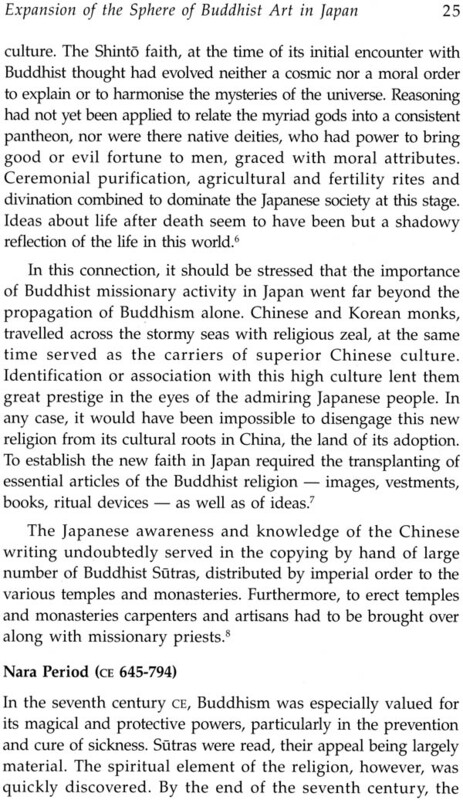 The present research study would surely be an important example of Indo-Japanese cultural relations which started from the sixth century (538 CE). THE present monograph is meant to bring to the notice of academic circle the historical background of esoteric Buddhism in Japan, the nature of an esoteric Buddhist deity called Fudo Myo-o (Sk. 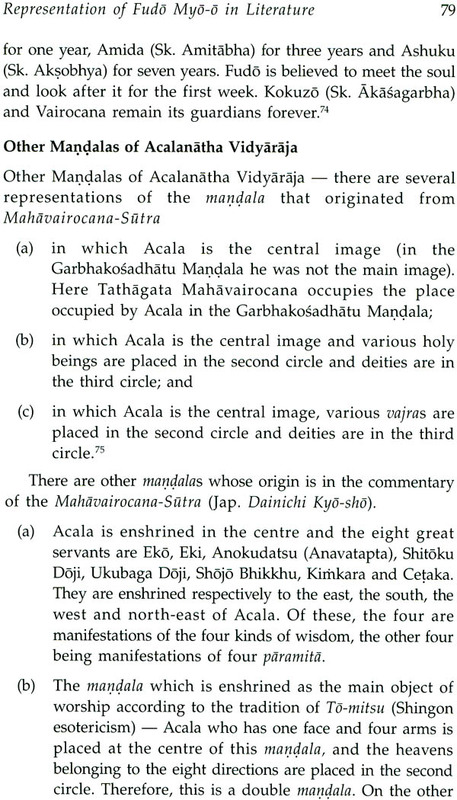 Acalanatha Vidyaraja) which has been enjoying a very wide popularity in Japan for quite an extent of time. 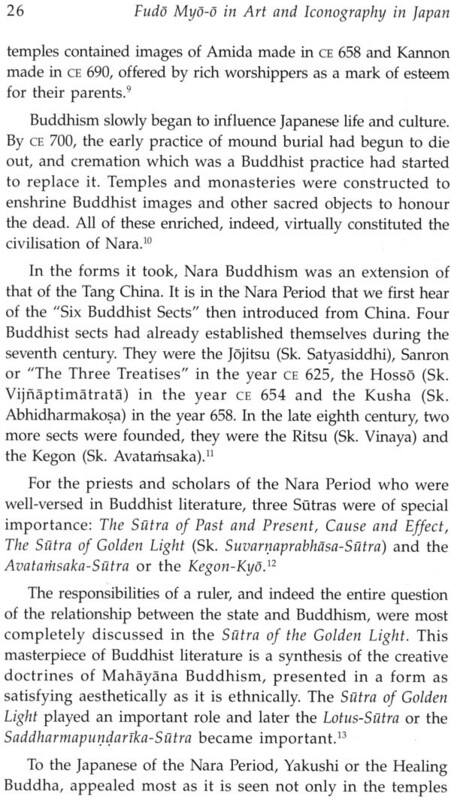 The evolution of esoteric Buddhism or Vajrayana Buddhism from Mahayana Buddhism in India, and the spread of Vajrayana Buddhism in Japan from China during the eighth century CE, and the growth and promotion of esoteric culture among the vast masses of people of Japan provide a very interesting scope of study. Not much endeavour has been made to study in detail the complex nature of Fudo Myo-o, an important esoteric deity and the diverse artistic expressions of Fudo as preserved in sculpture and painting in Japan, showing the images and their iconographic peculiarities. 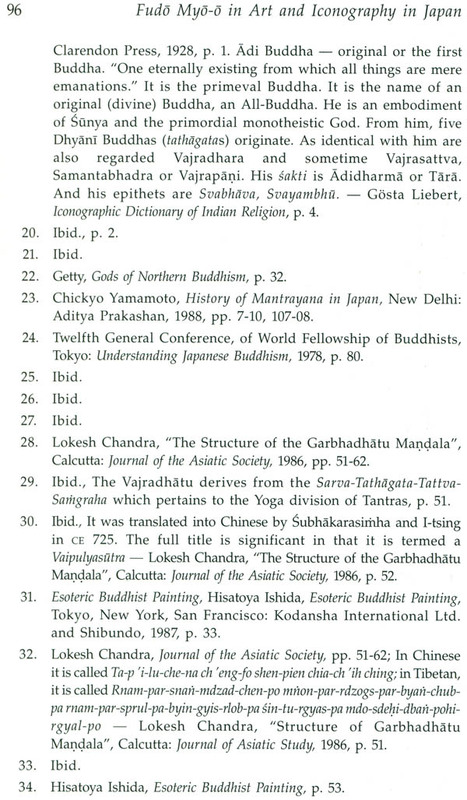 The present monograph which deals in brief about Vajrayana Buddhism, the historical background of esoteric Buddhism or Vajrayana in Japan, the iconography, nature and characteristics of the god Fudo Myo-o, and the artistic creations of Fudo in Japan from the ninth to the fourteenth century CE, is the outcome of my research work. The purpose of the present work is to present a detailed study about the god Fudo Myo-o and an attempt is made to highlight the rise of esoteric Buddhism in Japan, the philosophy of esoteric Buddhism, the nature, iconography and symbolism of Fudo MyO-O and the representations of the deity in sculpture and painting preserved in Japan and elsewhere. While selecting the subject of the present study, I was mainly attracted by the number of colorful depictions of the god Fudo and its peculiar iconography. I noticed that very limited work has so far been done on this deity and thought that a detailed study on the subject might bring about various facets of the deity, and art associated with it. The method adopted for the study of the subject has been mainly based on Buddhist literature in Sanskrit, previous scholarly works by eminent writers on the subject published in books, journals, and a detailed study of the specimens of art found in different books. Esoteric Buddhism, called Mikky in Japan, was part of a widespread movement, which had been powerful in India in the sixth and seventh centuries c and was transmitted to China by Buddhist monks, where it quickly established itself. Specialists of esoteric Buddhism who propagated the sect to China were ubhakarasithha (CE 637-741) from Nalanda, who translated about 30 Sutras and treatises at Chang’an including the Mahavairocana Sutra, the fundamental scripture of esoteric Buddhism; Vajrabodhi (CE 671-741) from Nalanda, who translated about 20 texts of esoteric Buddhism, and Amoghavajra (cE 705-55) who met Vajrabodhi in Java in CE 717 and became his disciple. He brought about 100 Sanskrit texts including the Tatt va-S ath graha, the highest authority of esoteric Buddhism. Amoghavajra had Hui-Kyo, a Chinese, among his disciples. Kobo Daishi (or popularly known as Kukai) from Japan visited China when Hui-KyO was in his last days, and became his disciple and learnt esoteric Buddhism rapidly. The new teaching was brought to Japan in c 806 by Kukai, and was known as Shingon, or True Word (5k. Mantrayana). 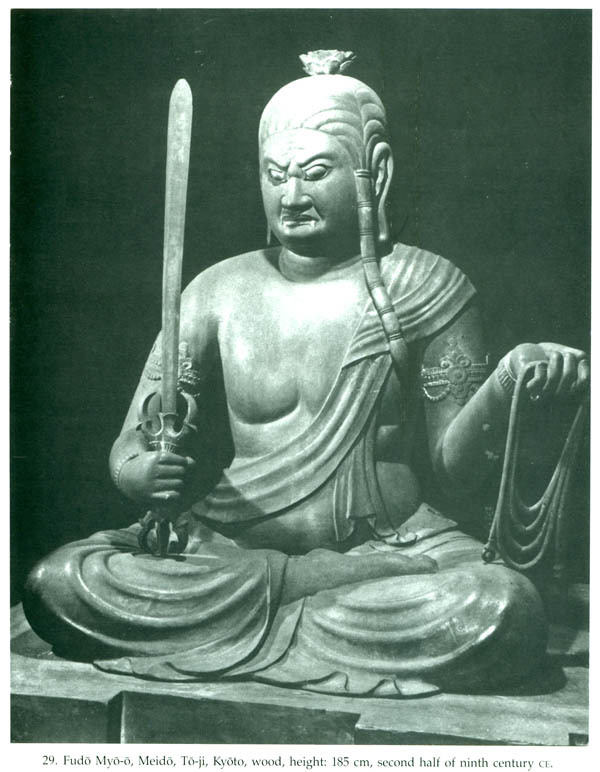 The core of Shingon Buddhism is the belief in the essential identity of all things in the person of the Supreme Buddha, Mahavairocana in Sanskrit, or Dainichi Nyorai in Japanese. To the Shingon believer, there is no difference between the world of senses and the world of ultimate reality, for both are manifestations of the same cosmic principle. There is no difference between the image and the deity, for in Shingon, the images are merely representations of the various aspects of Dainichi. The power and the wonder of mantra lay in its realization by meditation through the maijilala, and its appropriate conceptualization as ultimate meaning. The new spiritual energy found expression in gigantic paintings of the two cosmograms or maiyçlalas of Garbhadhatu and Vajradhatu. They co-ordinated the esoteric traditions of the ancient Indian universities of Nalanda in the north and Kanci in the south. Radical change was noticed in the deities themselves. Their strangeness and exoticness clearly revealed their Indian influence. Most of the images were not shown to the public but were kept hidden in the inner sanctum of the temples. Mikkyu images were often given an uncanny, wild aspect with multiple limbs and ferocious expressions. Such tendencies had already appeared at the end of the Nara period (CE 710-897) as in the many-armed Fukukensaku Kannon (Sk. Bodhisattva Amoghapaa) at the sangatsudo of Todai-ji, but these images can be regarded as forerunners of what was to come. In addition to the Buddhas and bodhisattvas, there were many new gods, among them the Five Great Kings, or Go-Dai-Myo-o, who as manifestations of Dainichi’s wrath against evil, have fierce and terrifying forms. 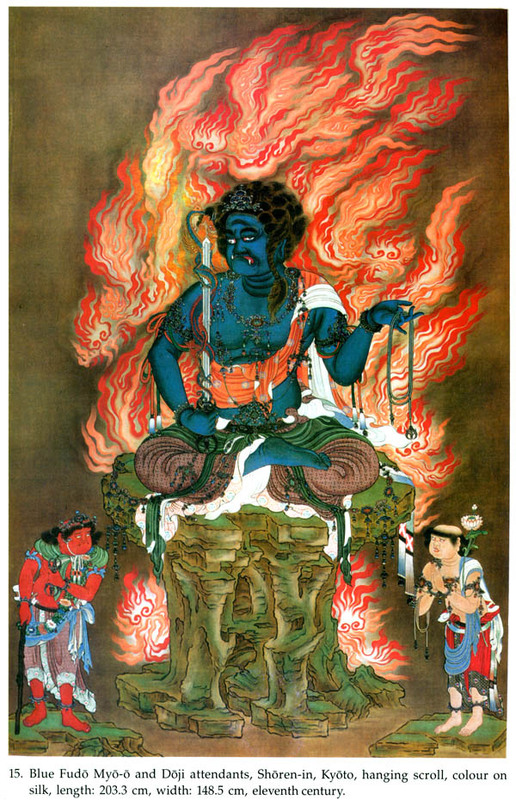 The most important of the MyO-O, one of the main deities of Shingon sect, is Fudo Myo-o, originally a form of the Hindu God iva. Usually appearing in the midst of the four other MyO-Os or Radiant Kings, are Daiitoku (Sk. Mahatejas), known in Tibetan Tantric pantheon as Yamantaka, Gosanze (Sk. Trailokyavijaya), Gundari (5k. Kundali), and Kongoyasha (5k. Vajrayaka). These MyO-O images were rather grotesque with their projecting fangs and childlike bodies adorned with skulls and snakes. 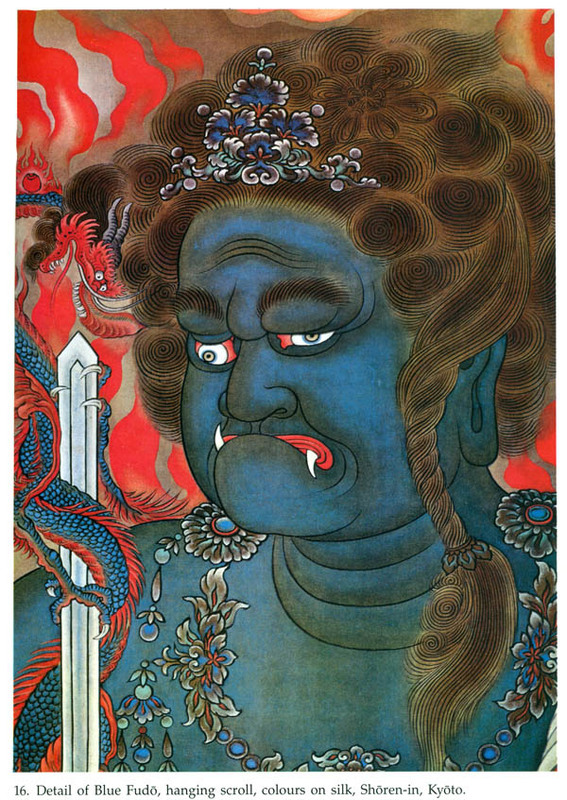 Fudo Myo-o is often represented singly both in painting and sculptures, as a terrifying god with facial expression full of wrath, attended by Kongara Doji and Seitaka or Cefaka Doji. As the Immovable One, he stands on a symbolic rock surrounded by flames, holding a rope and a sword with which he conquers all evils. Variations come in the number of attendants usually a pair of youths, but occasionally six or even eight. The portrayal of this god is done in various colours, yellow, blue or red. 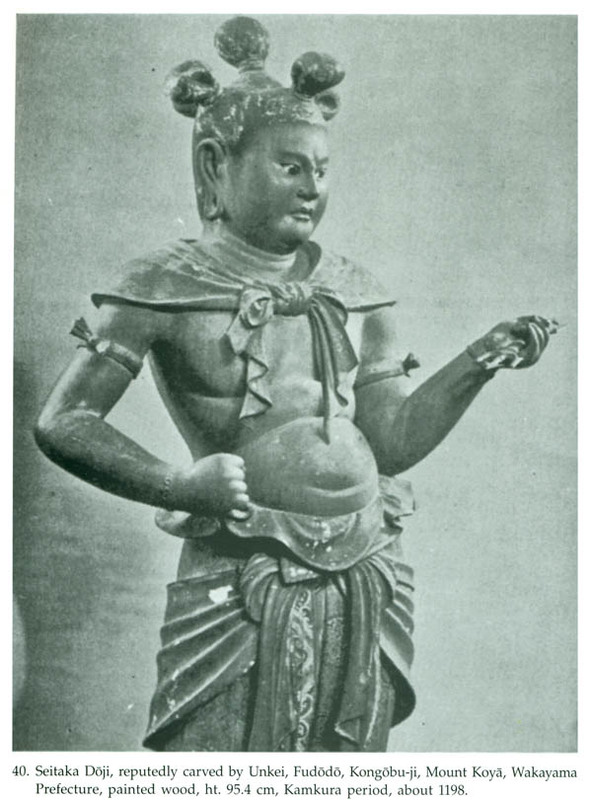 This interesting subject has been dealt with considerable care and objectivity bearing out in great depth the evolution of Vajrayana Buddhism in India, its spread in China and Japan, the study of esoteric Buddhist art, iconography, nature and visualization of Fudo Myo-o in art. The monograph is divided into five chapters, besides the Preface and Introduction. The first chapter gives an account of the introduction of Buddhism in Japan in the year CE 538, and the gradual transformation into esoteric doctrines during the ninth century. The predominance of faith in Mahavairocana and popularity in the worship of Fudo Mybô, the conqueror of all disasters and evil, have been discussed. 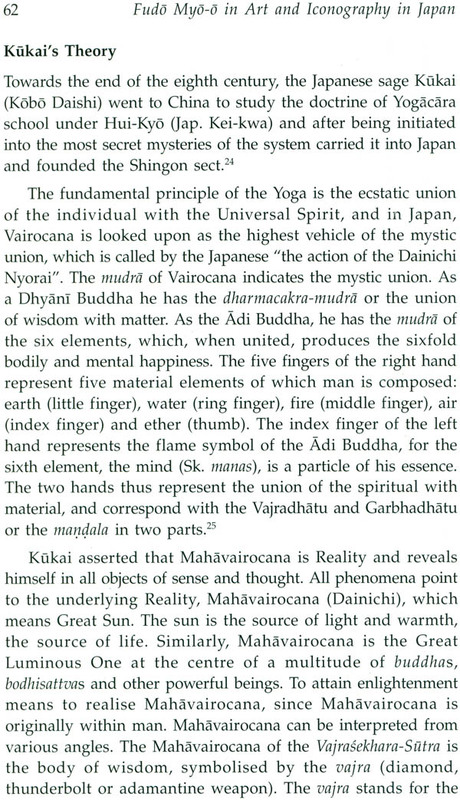 In the second chapter, the description of Fudo Myo-o as found in Buddhist literary sources from India, the iconography of FudO, his attendants, Fudo’s symbolic instruments, and interpretation of mudras (hand gestures), postures, emblems carried by Fudo have been studied. 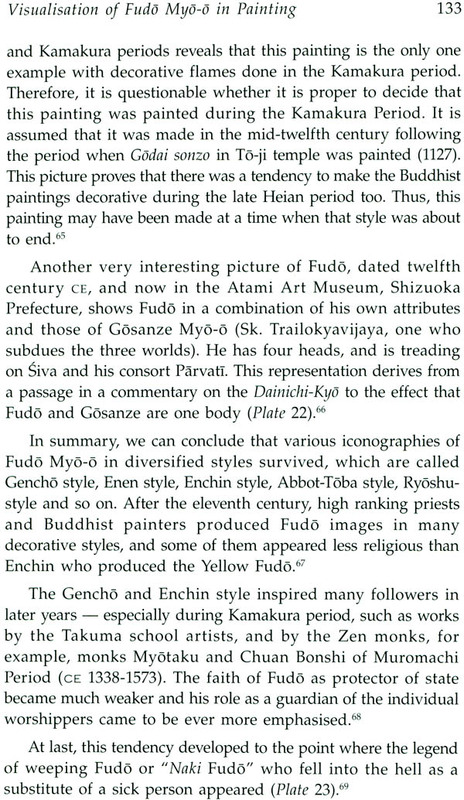 The third and fourth chapters deal with the visual representation of FudO MyO-o in painting and sculpture. 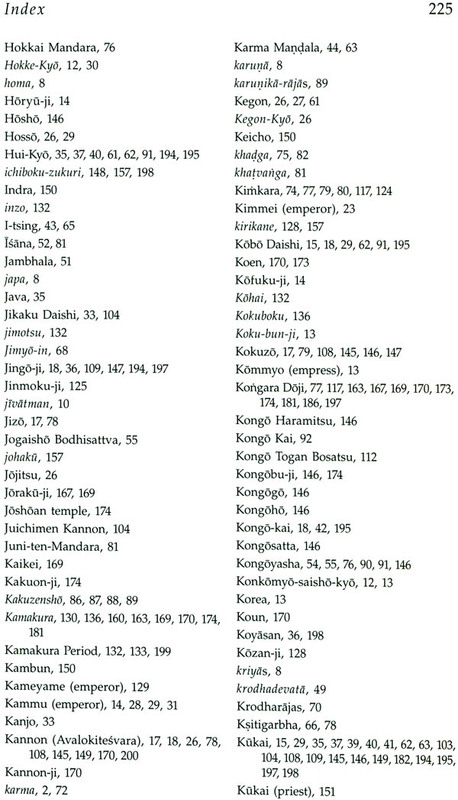 The Bibliography, Glossary and Historical Chronology of Japan have also been added at the end. The written work has been amply supported by photographs of sculpture and paintings of Fudo. The following books have been consulted and used to obtain illustrated material: Art in Japanese Esoteric Buddhism, Heibonsha John Weatherhill, New York, Tokyo, 1972; National Treasures of Japan Series II, IV, V. Mission for Protection of Cultural Properties, 1952, 1956, 1959; Miyahara Ryusen, Buddhist Painting, Kosei Publishing House, Tokyo, 1981; Danielle Elisseeff and Vadim, Art of Japan, Harry N. Abrams Inc., New York, 1980; Masao Ishida, Japanese Buddhist Prints, Kodansha mt. Ltd. and Shibundo, Tokyo, Palo Alto, New York, San Francisco, 1987; Masao Ishida, Japanese Buddhist Prints, Kodansha Tnt. Ltd. and Shibundo, Tokyo, Palo Alto, New York, San Francisco, 1987; Hisaki Mori, Sculptures of Kamakura Period, Heibonsha/John Weatherhill, New York, Tokyo, 1974; Hisatoya Ishida, Esoteric Buddhist Painting, Kodansha International Ltd. and Shibundo, Tokyo, New York, San Francisco, 1987; Edward J. Kidder, Art of Japan, Thames and Hudson, London, 1985; Awakawa Yasuichi, Zen Painting, Kodansha International Ltd., 1970 Victor Harris and Ken Matsushima, Kamakura: The Renaissance of Japanese Sculpture 1185-1333, British Museum Press, 1991, and Takaaki Sawa, Art in Japanese Esoteric Buddhism, Weatherhill/Heibonsha, Tokyo, New York. I take this opportirity to express my deep sense of gratitude to Dr D.N. Bakshi Director, Japanese Study Centre, Kolkata, for writing the Foreword of the book. I am also thankful to the authorities of the libraries of Japan Foundation, New Delhi, National Museum Institute, National Museum, and Kala Nidhi, Indira Gandhi National Centre for Arts, for their co-operation and help. BUDDHISM arose in the sixth century BCE in the wake of Upaniadic speculations. This religion Centers round the teachings of Gautama the Buddha, one of the greatest thinkers and reformers that the world has ever seen. The age (i.e. the sixth century BCE) into which Gautama was born was one of religious ferment. He and his contemporaries, Mahavira in India, Zoroaster in Iran, Socrates in Greece, Confucius and Lao-tzu in China were the intellectual luminaries of the epoch, who by their sublime thoughts and teachings ushered in an era of critical understanding and spiritual enquiry. Gautama revolted against the existing orthodox Brahmaçiical system predominated by rituals and the ceremonies involving animal slaughter. He accepted the best of the existing system and rejected what he did not consider useful or beneficial to man to gain knowledge and emancipation. In formulating his religion, he was largely influenced by the liberal thinking of the Upaniadic sages, the prevailing idea of knowledge and Yoga practices (leading to mental concentration), the theory of karma3 and the values of mendicant life. As the Buddha influenced very greatly the religious thought in India, his advent has been considered an event of phenomenal importance. He discovered a way of life which can be followed “regardless of time, place and prevailing culture”. He showed the path which leads to cessation of suffering and attainment of knowledge and emancipation.5 Buddhism is a religion of kindness, humanity and equality. 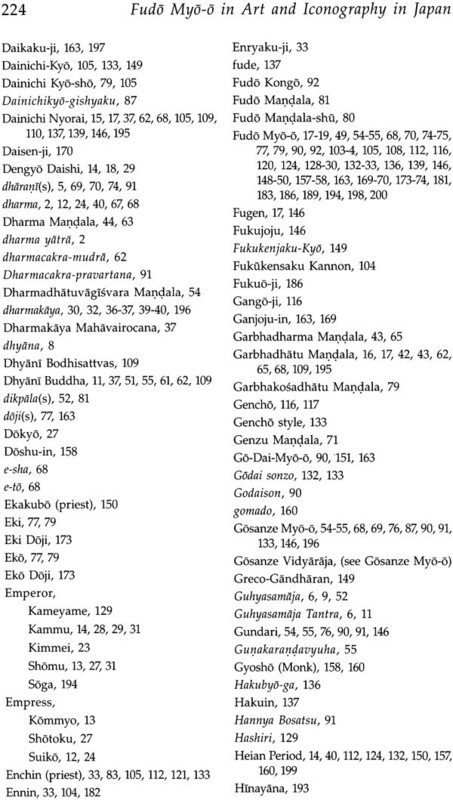 The early Buddhism centers round Buddha’s teachings as maintained in the Pali canon. Sila (good conduct), samadhi (concentration) and prajna (wisdom) form the core of the Buddha’s teaching. Buddha held that existence is suffering. Suffering has a cause. There is a way to overcome it and the Buddha alone knows the way. The practice of the noble eightfold path leads to the cessation of suffering, and the attainment of nirvana or emancipation. The great Emperor Moka of the Mauryan dynasty was deeply interested in the Buddhist religion and contributed much to its growth and diffusion. Tradition avers that Moka was cruel and aggressive in his early days, but ultimately he took refuge in the Buddha, the dharrna, and the sathgha. 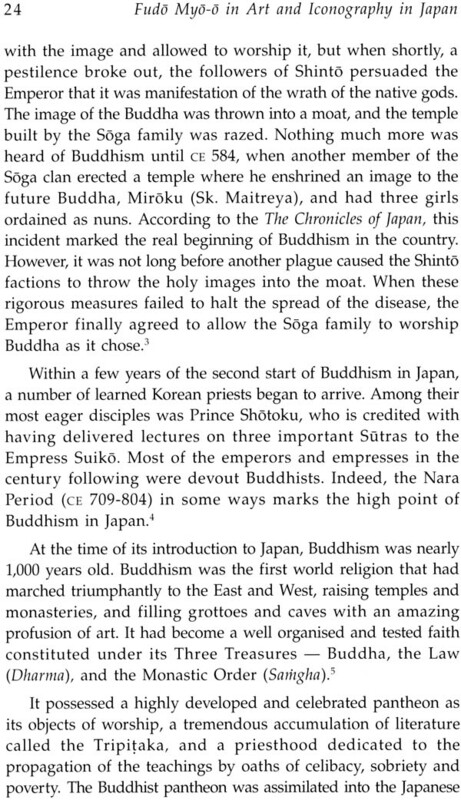 In fact, the reign of Agoka was a landmark in the history of Buddhism. His inscriptions indicate that Moka paid visits and honoured the places associated with the events of the Buddha’s life (Sk. dharma yatra or pious tours). Moka’s message of concord, tolerance, piety and morality had been well received, also in the dominions bordering his empire. His own son Mahendra went to Sri Lanka to preach the gospel of the Buddha. His daughter Sañghamitra also joined her brother in missionary activities. 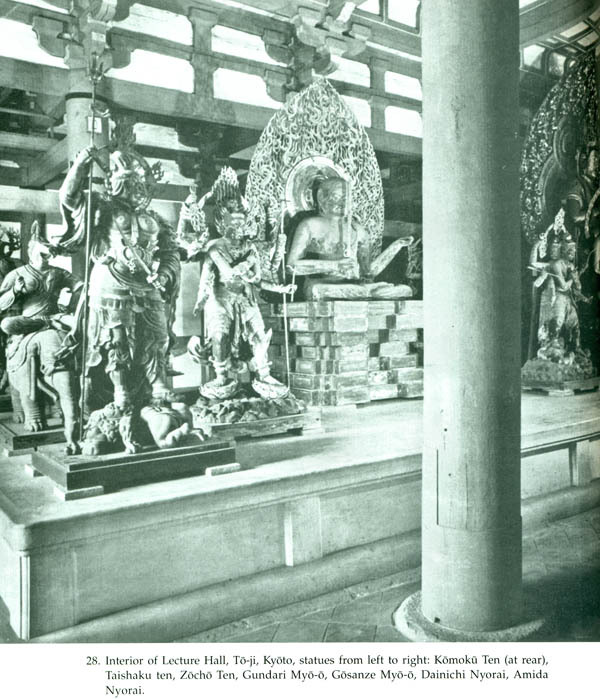 Aoka also erected an enormous number of stupas over the holy relics of the Buddha. With these new schools, not arhathood but Buddhahood became the goal of the monks. With the deification of the Buddha, new Buddhist deities, Avalokitevara and others were gradually introduced. The followers of the new school called themselves Mahayanists, i.e. the followers of the greater vehicle throwing open the possibilities of salvation and Buddhahood to all and designated the followers of the earlier or orthodox school as Hinayanists, i.e. the followers of a smaller vehicle, with whom self-realization or individual arhathood was of primary concern. 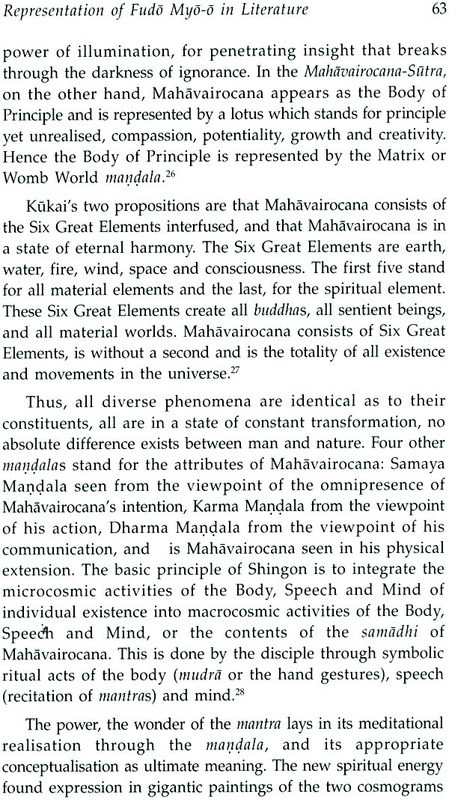 The scholastic tradition of Mahayana can be divided into three schools: Madhyamika, Yogacara, and the school of Saramati. The first two dominated the intellectual life in India. The third had a short-lived but important influence on Tibet, and indirectly may be considered an important element in the development of East Asian Buddhism. The Madhyamika School was founded by Arya Nagarjuna in the second century c. The Yogacara School laid emphasis on yoga as the most important method for attaining enlightenment. Bodhi can be attained after all the stages of spiritual progress have been gone through. The school was founded by Maitreya in third century It is difficult to access the nature and cause of the decay of Mahayana in India. 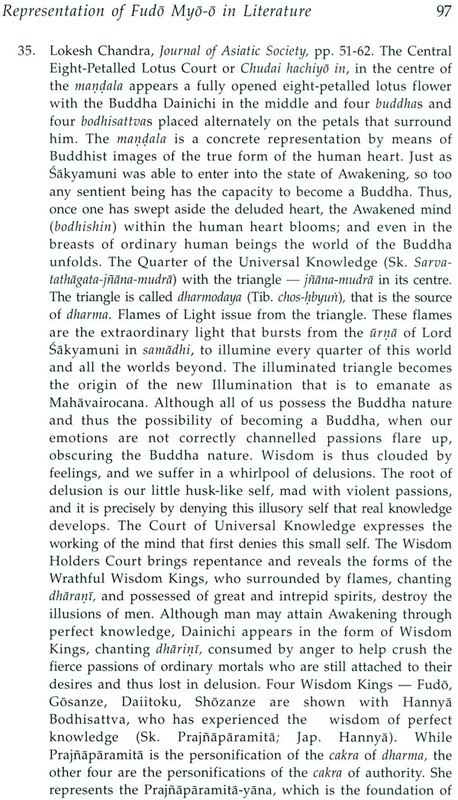 Although it is possible to argue that the early success of Mahayana led to a tendency to look inward, that philosophers spent their time debating subtle metaphysical, logical points, the truth is that even during the period of technical scholasticism, constructive religious thought was not dormant. But it may be that as Mahayana became more established and conventional, the natural need for religious revival found expression in other vehicles.